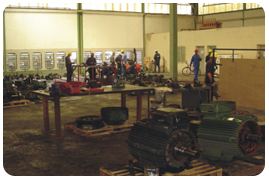 On account of consistent and reliable services over the years, our clients always rely on us for overhaul of their critical plants and process equipment. Depending on our client’s need, Morpol may deploy her engineers and set up mobile workshop at customer’s facilities to facilitate and enhance an efficient overhaul of equipment in situ. In some cases identified equipment requiring overhaul may be disconnected and transported offsite/to the workshop to enable our Engineers carry out a complete overhaul and testing to client’s satisfaction before returning same.